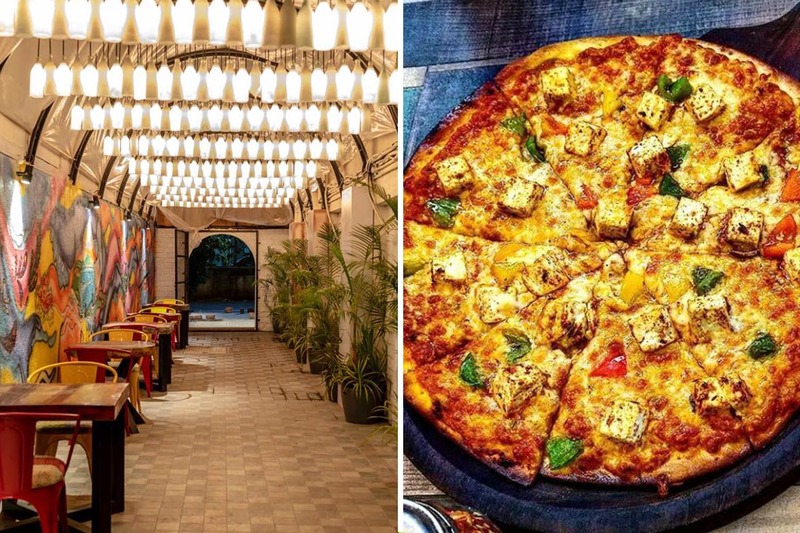 John Lennon graffiti on the walls, psychedelic artwork, bursts of colours everywhere and textured flooring...Hippie@Heart at Deccan Gymkhana is the newest, coolest eatery in town that you need to check out right now. One thing that immediately stands out for us at Hippie@Heart is its vibrant decor with rustic wooden furniture, eccentric street art, neon-lit bicycles stuck up on the walls, hanging lights, an airy outdoor setup and more. When it comes to food, there is a lot to choose from. The 11-page vast menu caters to all kinds of foodies; from meat lovers to vegetarians and sweet tooth. We recommend you try their lamb vol-au-vent, savoury crunchy puffs filled with minced mutton and cheddar cheese. If you're in a mood to try something different, order zapiekanka, which is a traditional Polish baguette topped with roasted mushrooms, caramelized onions, cheddar and mozzarella. For drinks, must-try the extensive range of draught beers or go for a Hippie-special flower power cocktail comprising jasmine infused Smirnoff, pear, martini rosso and lime. Currently, their dessert selection is extremely chocolate heavy. For those of us who love to explore other flavours too, the options are a tad limited out here. Hippie@Heart also has apple cider and coffee meads by Moonshine Meadery on tap.